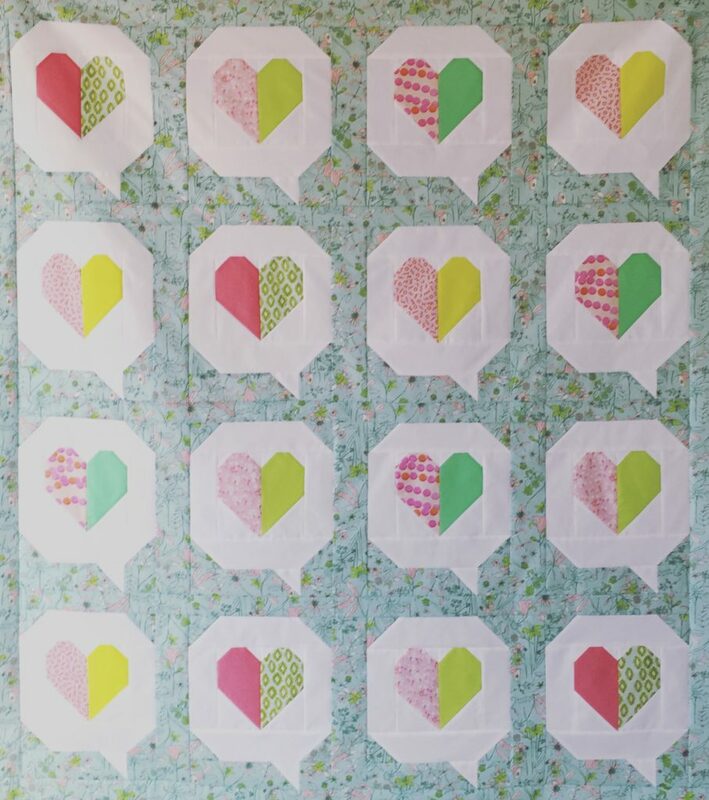 My “I Heart You Quilt” is just about finished! 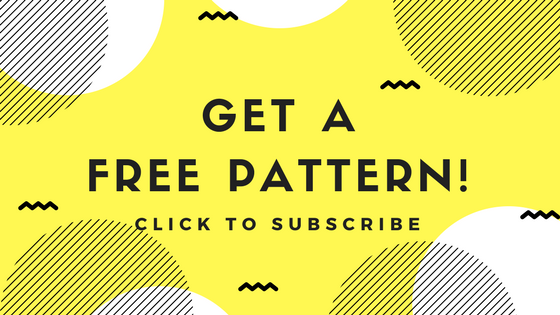 This pattern is a collaboration by Pen and Paper Patterns and Then Came June. Over January they ran a really fun quilt along and I can’t believe how much progress I made. It’s a testament to this pattern that it came together so quickly, and now I have a quilt top, ready in time for Valentine’s Day. 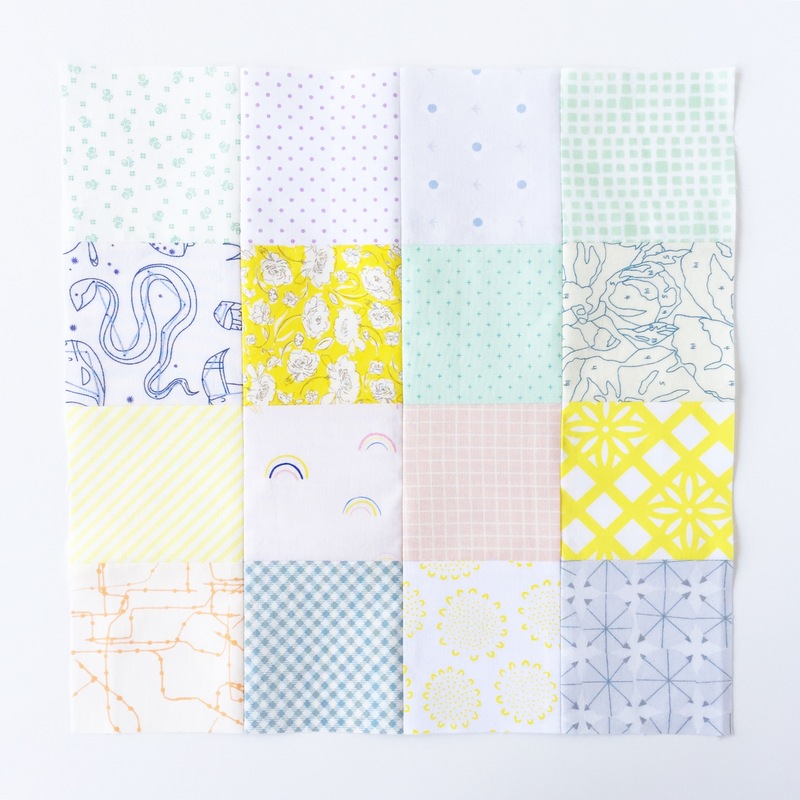 There is lots of opportunity with this quilt to play with different print mixes. I went with a combination of pinks and acid lime greens for my heart blocks. The blue background fabric is from Art Gallery Fabric’s “Signature” collection by Sharon Holland. 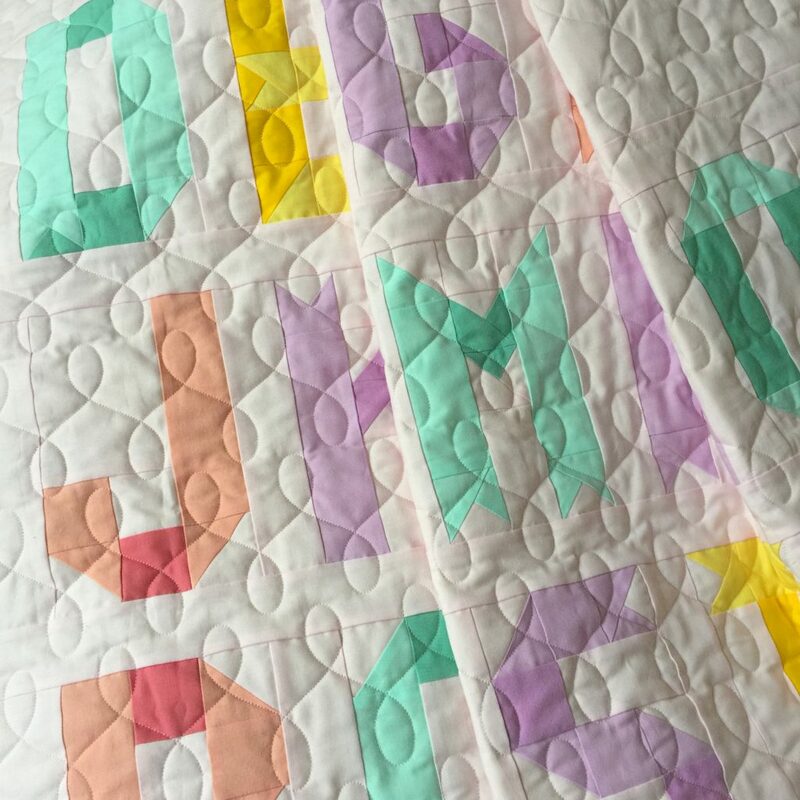 This is kind of hard to believe, but apparently I never wrote a post about my new alphabet quilt block pattern layout for the Ribbon Letters Quilt when I published it last year! So I thought I’d put something together with all the details, including answers to frequently asked questions, which you can find at the bottom of this post. TLDR: you can get the new pattern here! The new layout makes a 50″ x 56″ throw quilt. 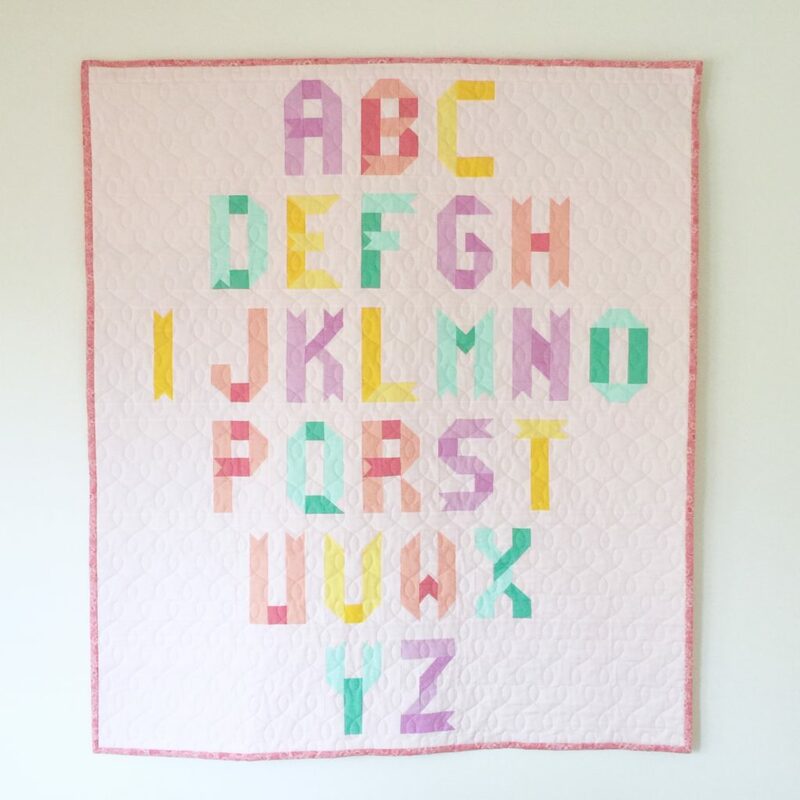 Each letter measures 5″ x 8″ and there individual measurements and cutting instructions for every block, so you can customize this to make a baby name quilt or wall hanging of any size and with any combination of letters. And the back. The binding is a Liberty of London quilting cotton. Here are all the answers to questions I’ve received about this quilt. If you have any questions (or need any help once you start sewing) please leave them in the comments. Does this quilt use templates or paper piecing? The Ribbon Letters Quilt is made entirely with traditional patchwork piecing. No templates or paper piecing required! Is this a good quilt pattern for a beginner? Yes. I would say that this is a great quilt for a confident beginner. 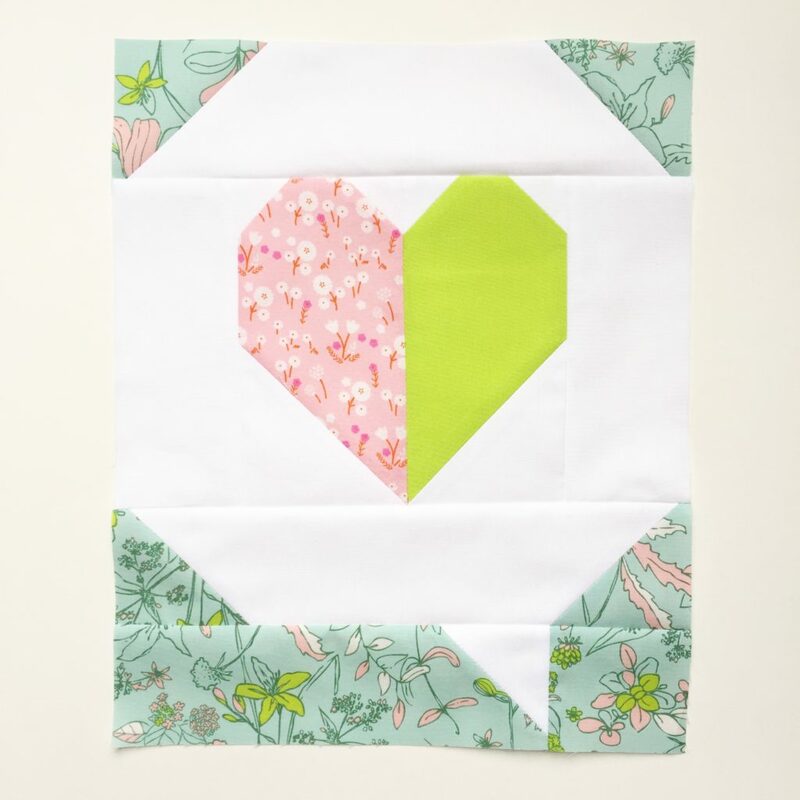 The most complicated part of the quilt is sewing half square triangles (HSTs) … so if you’re comfortable with those, this will be no problem for you. 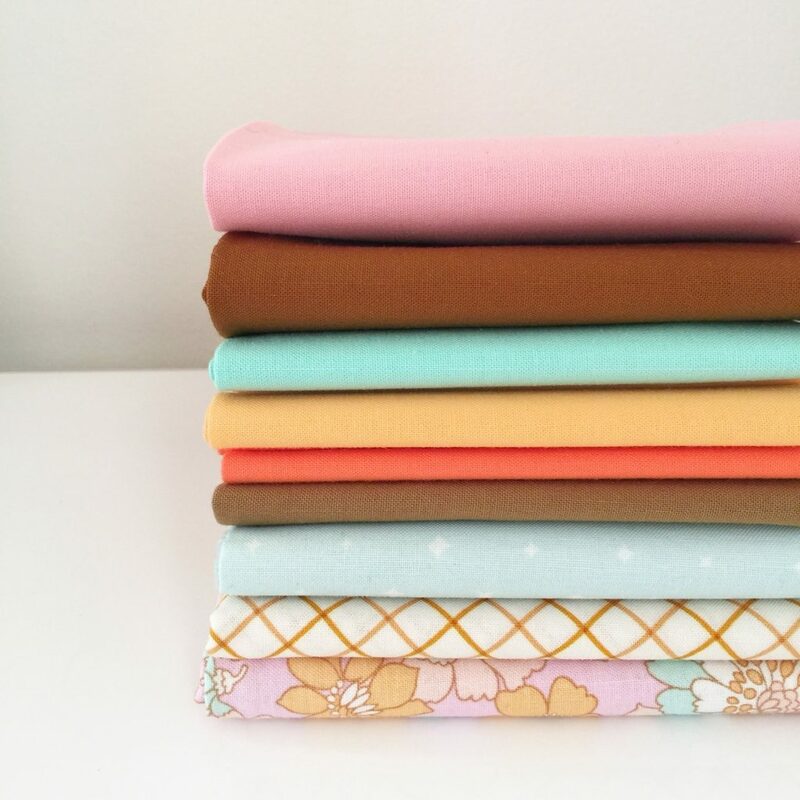 What are the fabrics used in the quilt pictured above? Where can I find the pattern? The alphabet quilt block pattern is available as a digital download in my Etsy shop. 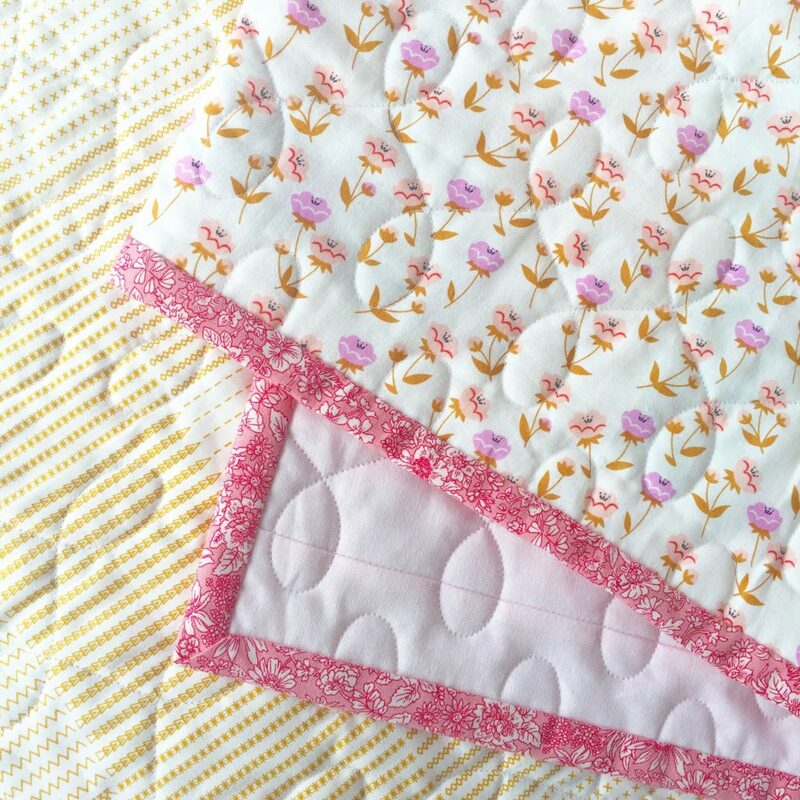 Long arm quilting: The beautiful long arm quilting on the version on the pattern cover was done by Spooled Rotten Quilts. 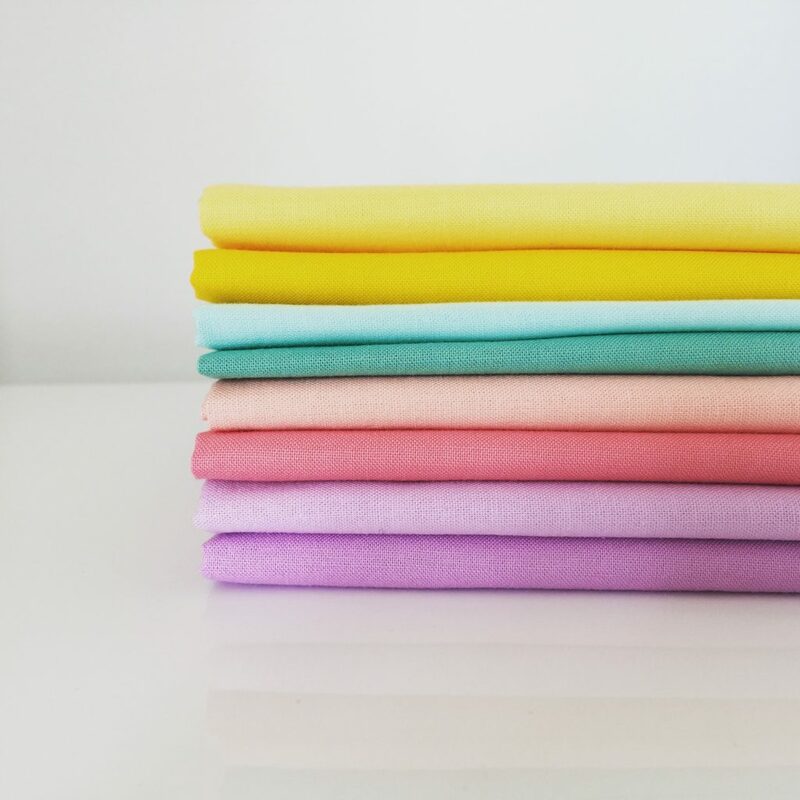 Kona cotton solids: Are available at many local quilt shops, but you can see the full range here. The pattern: Is available in my shop. If you’d like to try it out first, you can download the letters ABC when you subscribe to my newsletter. Quilt along season is here! Of course there are sew alongs and block of the month programs happening throughout the year, but January in particular always seems to bring a slew of fun group sewing opportunities, so I thought I’d do a little round up of 2019 quilt alongs. They’re such a great way to sew through your fabric stash (something I’m really committed to doing this year) and meet kindred spirits in the quilting community. So every year I dive into at least a few. In choosing which quilt alongs I wanted to join I came across quite a few that looked great. 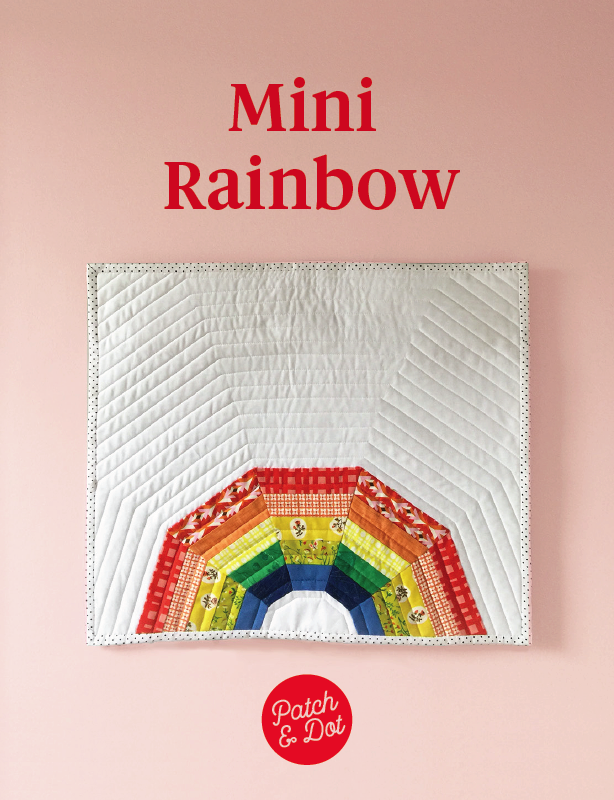 (You’ll find a list of all the 2019 quilt alongs and block-of-the-month series that caught my eye at the bottom of this post.) Ultimately I decided that I would do just two (for now, ha ha), plus create my own secret BOMs behind the scenes, with the aim of having at least one free quilt along to share with you this time next year. And of course I’m also lucky to be part of an amazing beehive group, the Royal Canadian Quilter Bees. A Year with Miss Lizzy is a bit of a choose your own adventure block of the month pattern created by Angie over at Gnome Angel. You can opt for either a traditional sampler or a contemporary sampler. (Or both!) I’m sewing the contemporary, 12 block version, because I like working with big blocks, and I like the pace (and anticipation) of getting a new block pattern to work on each month. 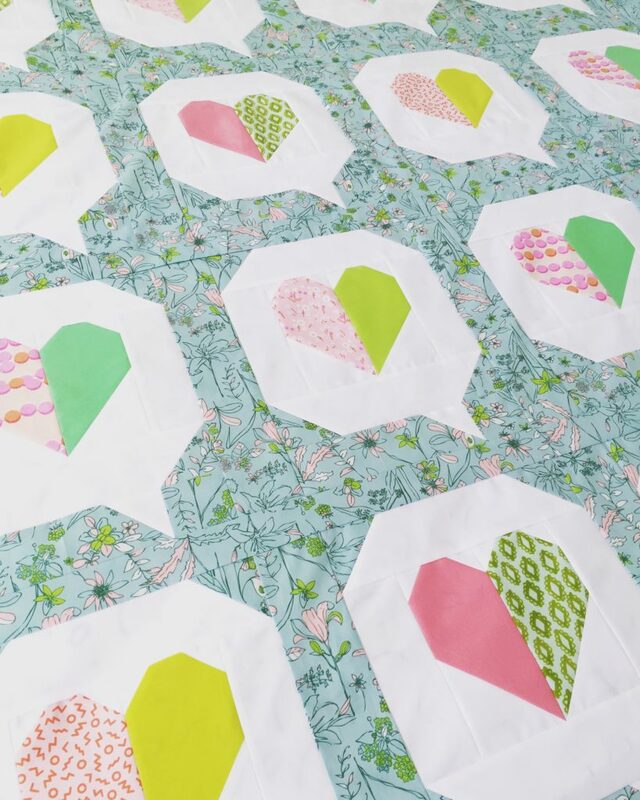 Next up is a quilt along taking place in January, the I Heart You Quilt sew along. This is a pattern is a collaboration by Pen and Paper Patterns and Then Came June. I’ve chosen to sew my blocks in a palette of blue, pale pink, and acid lime (that background fabric is part of the “Signature” collection by Sharon Holland for Art Gallery fabrics. It’s a really fast sew so you can still join in (otherwise check out the Taco Truck and Sweet Treats quilt alongs, links at the bottom of this post). I could not resist joining the quilt along for the beautiful Chamomile Quilt Pattern by Woodberry Way. It’s a low volume quilt for which I’ve done all of my block cutting (but not the sashing) and started piecing. So far I am in love with the efficiency of this pattern. 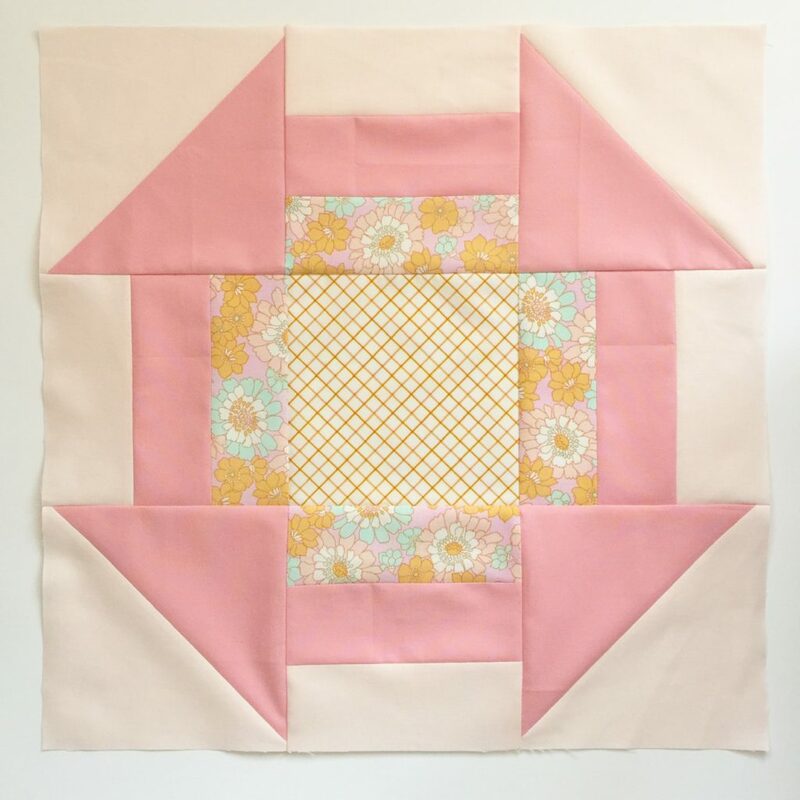 It makes great use of fabric (I’m using fat quarters) and has a really clever methodology for quickly creating the patchwork blocks (like the one below). This time last year I started a new quilting adventure with a group of ladies from across Canada, thanks to Alyce of Blossom Heart Quilts who, along with providing a set of free block patterns perfect for group quilting bees, provided an amazing service organizing quilters into hives (follow her blog or newsletter for the next one, usually happens towards the end of the calendar year). The block below is a Ripple block (design by Angie of Gnome Angel) that I made for January’s queen bee. Here’s a running list of quilt alongs (some are free, some require a pattern purchase but very often there will be a discount in the lead up to QAL launch). I’ll keep adding to this list as the year goes on. 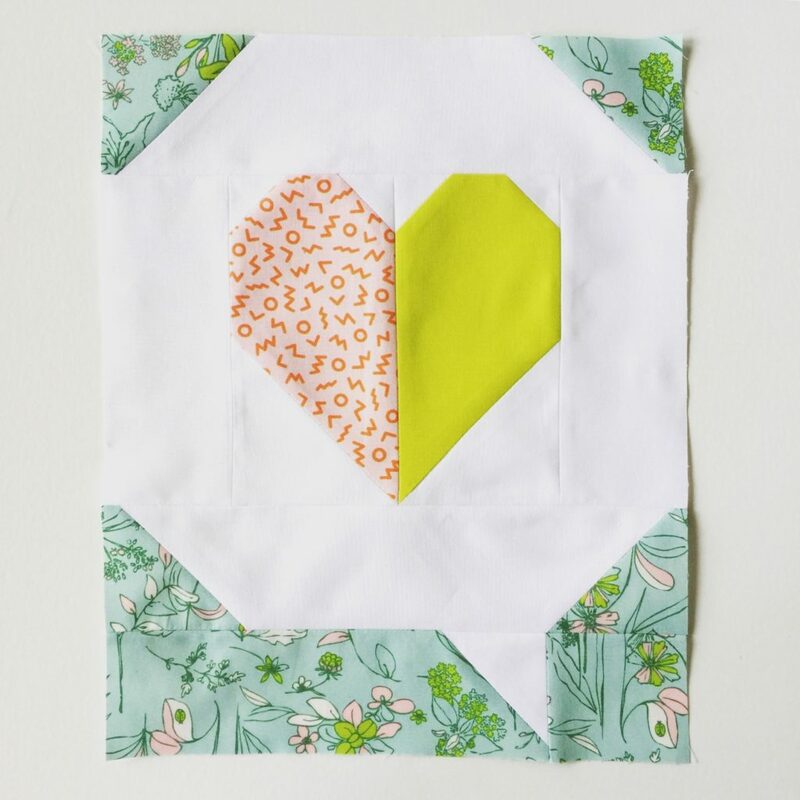 Aurifil Designer of the Month Block … this one is free mystery quilt, with a new block by a different designer revealed each month. Threadology quilt along … a spool-themed quilt along benefiting the Make a Wish charity. 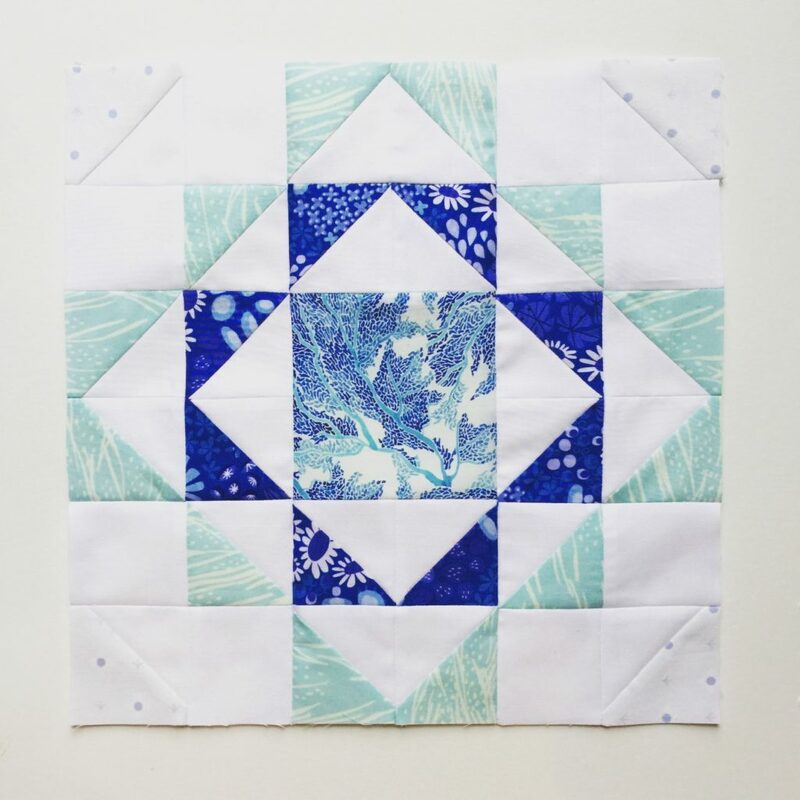 Papercuts 2019 Block of the Month … a very cool paper snowflake-style paper piecing quilt along from Amy Friend. Have you joined or started any quilt alongs for 2019? Let me know in the comments! 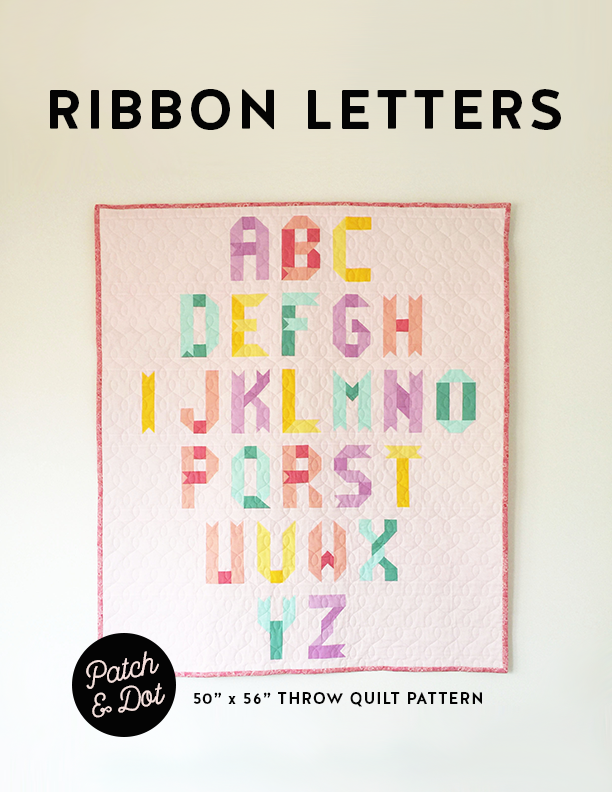 Get a free copy of the Ribbon Blocks ABC pattern to download when you sign up for the Patch and Dot newsletter. WordPress theme: Betsy by Patch and Dot.